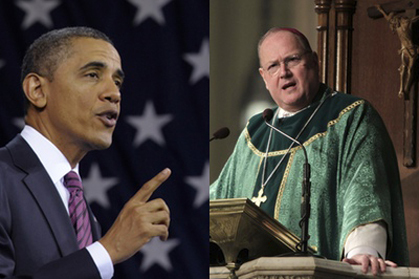 The decision by Cardinal Timothy Dolan to invite President Obama to the Al Smith dinner in New York is a very good political move. Contrast that with his predecessor, Cardinal Edward Egan, who refused to invite Senator John Kerry when he was opposing President Bush. Dolan was never going to allow himself to be caught in the meat grinder that Egan did on that occasion. Though he is suing Obama over health care legislation Dolan knew that snubbing Obama on this occasion would cause a huge backlash. The Al Smith dinner called after the first major Irish Catholic candidate for president, is a presidential year tradition, a night when the impact of the Catholic vote is recognized. Dolan knew what happened his predecessor. Egan came under immense pressure and eventually kicked for touch and invited Hugh Carey as the Obama surrogate and President Bush senior as his son’s spokesman. It all came crashing down on Egan who suffered a massive loss of prestige as a result. With a Catholic Democratic governor in Andrew Cuomo with whom he has cordial relations, Dolan knew well that not inviting Obama would cause a huge rift. Obama’s presence on the night will be significant. The Catholic vote is absolutely critical in this election, especially in key states such as Ohio and Pennsylvania. Ironically the tenets of Mormonism are far more hostile to Catholicism and potentially cause problems for Romney than anything Obama might have to say. Joseph Smith, the founder of the Mormon religion, speaking of the vision he had to start his church noted that he asked his angel what about other religions. "I was answered that I must join none of them, for they were all wrong; and the Personage who addressed me said that all their creeds were an abomination in his sight; that those professors were all corrupt; that: they draw near to me with their lips, but their hearts are far from me, they teach for doctrines the commandments of men, having a form of godliness, but they deny the power thereof. He again forbade me to join with any of them;..."
Romney will obviously not be highlighting that aspect of the relationship between his religion and that of Catholicism. Apart from the debates the men will not be seen in the same company other than at the Al Smith dinner. Cardinal Dolan has done the right thing here and deserves credit. There is more than enough divisiveness in American politics already.